“Riverwood” is a small residential development of 3 detached bungalows in a semi-circle in the quiet village environment of Timolin. Situated just off the R448 which was the old N9 Dublin/Carlow Road. 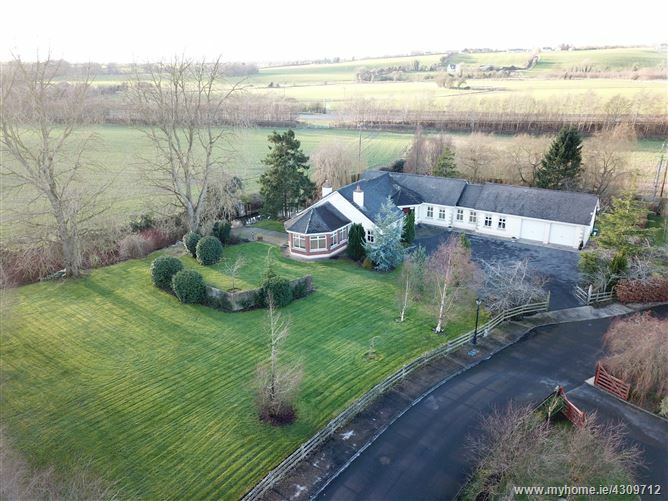 Set on a large c. 1 Acre site approached by a tarmacadam drive with landscaped gardens, paved patio area and stream which meanders around the boundary of the property. 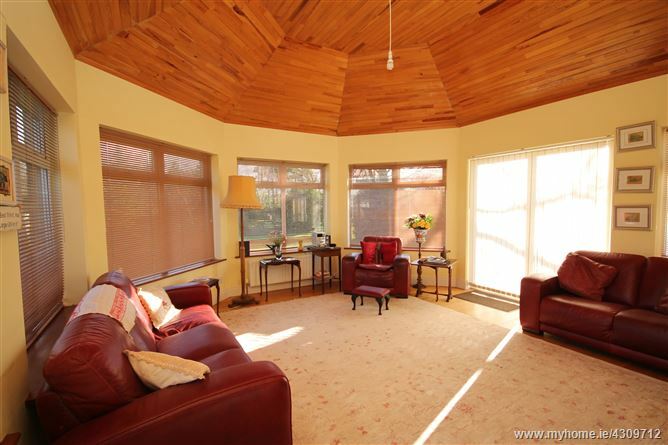 Built in approximately 2000 the bungalow contains c. 234 sq. m. (c.2,518 sq. 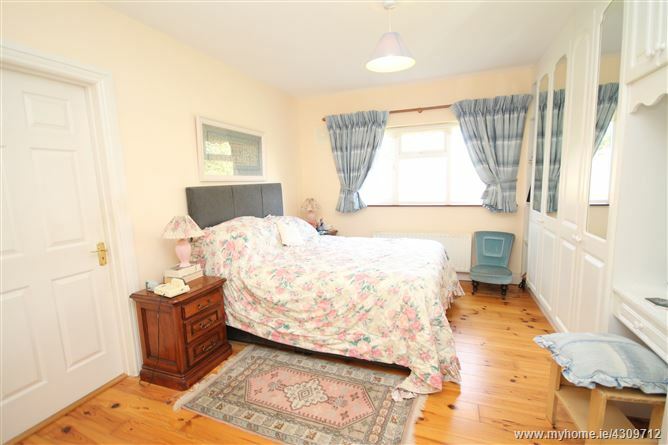 ft.) of spacious well presented living accommodation with the benefit of oil fired central heating, PVC double glazed windows, large double garage containing c.46.4 sq. m. (c.500 sq. ft.) ideal for conversion (subject to the usual PP), reconstituted granite window cills and coin stones. 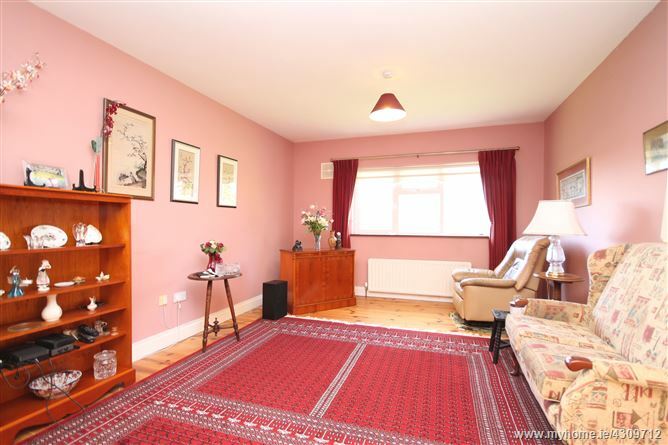 Timolin is a small village environment adjacent to Moone Village with easy access to the surrounding towns and villages including Ballitore c.3km, Grangecon c.7 km, Dunlavin c.12 km, Athy c.14km, Castledermot c.8 km, Carlow c.16 km, Kilcullen c.16 km and Baltinglass c.8 km. The M9 Motorway access at Junction 3 is only a short drive whether you are heading north or south. Rathsallagh House/Golf Club and Kilkea Castle Hotel/Golf Club are only a short drive with some other fine golf courses in the area to include Athy, Carlow and Baltinglass. 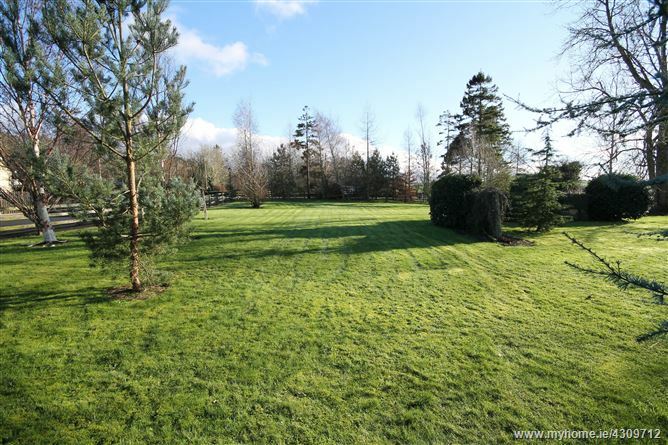 Set on a large c.1 Acre site approached by a tarmacadam drive to front with gardens mainly in lawn with a selection of trees, shrubs, hedges, flower beds and paved patio area. 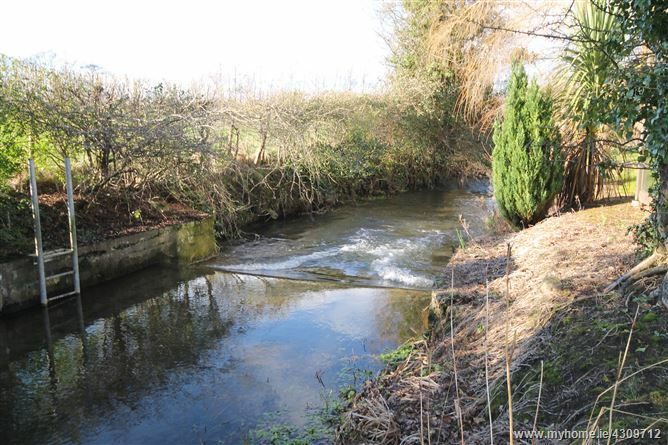 There is a stream which meanders along the boundary of the property. Mains water, septic tank drainage, oil fired central heating and alarm. SOLICITOR: Burns Nowlan Solicitors, Newbridge, Co. Kildare. 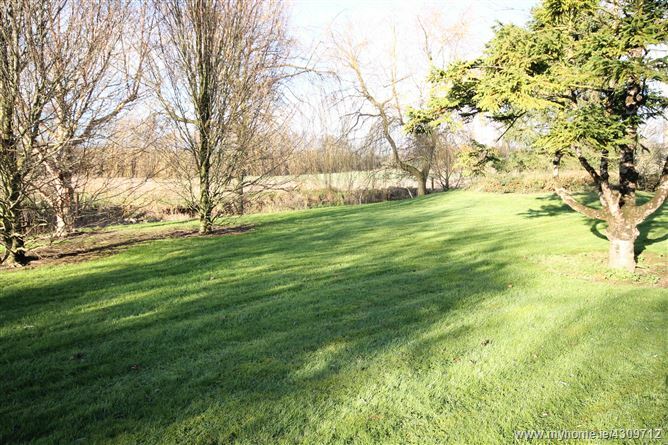 •	Large c.1 Acre landscaped site. •	Small development of 3 houses. •	Spacious c. 230 sq. m. (c. 2,518 sq. ft.). •	Stream meandering past the property. •	Granite cills and coin stones. 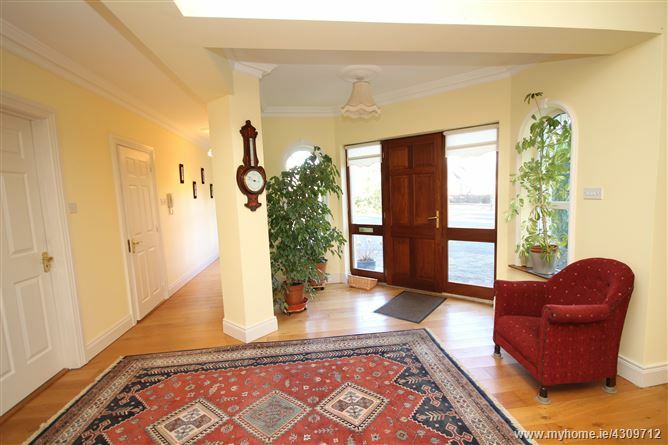 Entrance Hall: 5.85m x 4.15m with oak floors and coving. 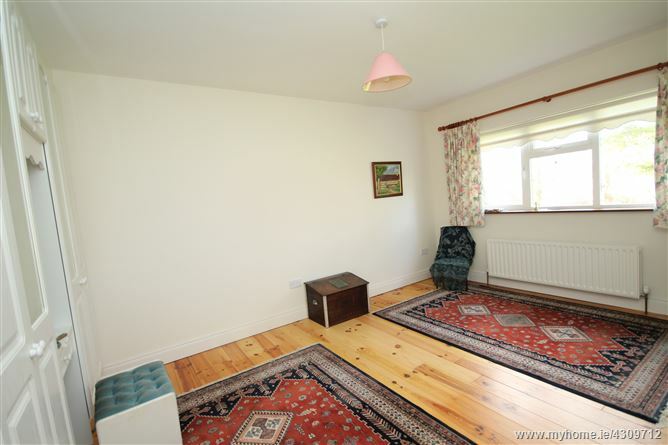 Sittingroom: 5.32m x 4.8m with oak floor, wood panelled vaulted ceiling, feature marble fireplace with gas insert and patio doors to garden. 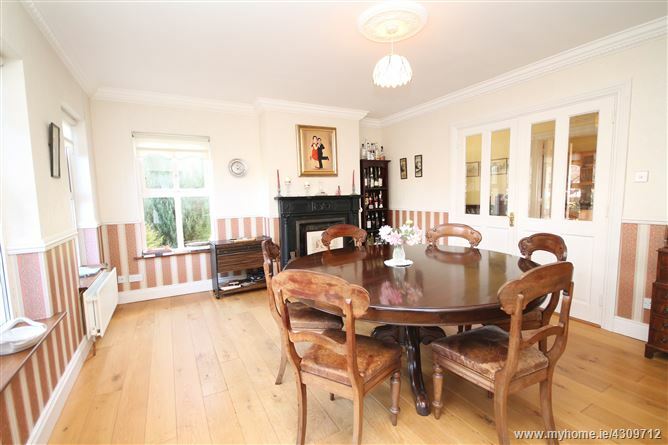 Diningroom: 4.9m x 4.1m with oak floor, coving, feature cast-iron fireplace and double doors. 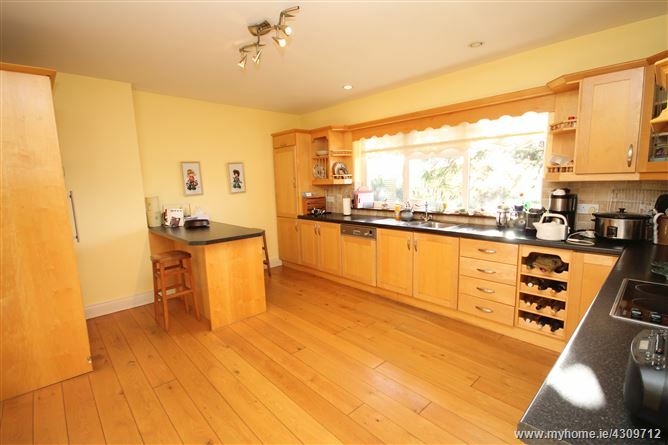 Kitchen: 4.9m x 3.87m with maple shaker style built-in ground and eye level presses, s.s. sink unit, tiled splashback, Neff oven, Ariston ceramic hob, extractor unit, oak floor, Bosch integrated dishwasher, integrated fridge/freezer, recessed lights and double doors. Utility: with maple shaker style built-in ground and eye-level presses, s.s. sink unit and plumbed. 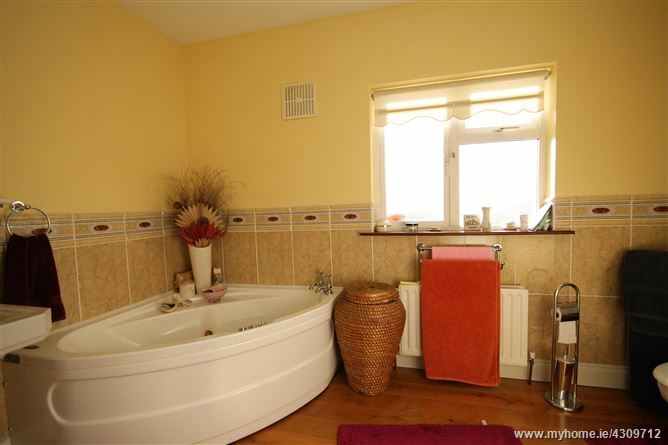 Bathroom: 3.66m x 2.12m with oak floor, Jacuzzi bath, w.c., w.h.b., shower and tiled surround. Livingroom/Bedroom 5: 6.2m x 3.8m with pine floor. Bedroom 1: 4.92m x 3.5m with pine floor and double built-in wardrobes. Ensuite: Shower, w.c., w.h.b., pine floor and tiled surround. Bedroom 2: 4.9m x 3m with pine floor and range of built-in wardrobes. Bedroom 3: 6.2m x 3.3m with double built-in wardrobes and pine floor. 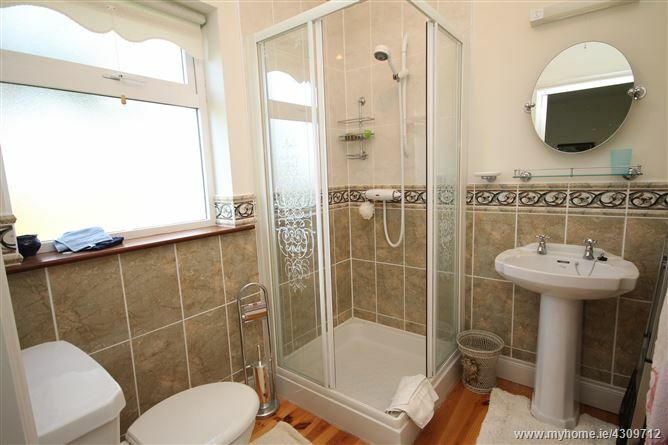 Ensuite: w.c., w.h.b., shower, pine floor and tiled surround. Bedroom 4: 3.8m x 3m with pine floor.